What is the random glucose test? When can I perform it? How to read and interpret its results? Actually, this random sugar test is also called a simple glucose test. You use to do it by yourself when you want to measure your blood sugar levels at any time during the day. It’s very easy to perform it, that’s why called simple (random) blood glucose test is. You can use any glucose meters that can be found in the market. Basically, this is a test that you perform to get to know what the levels of your blood glucose are at any time of the day to better monitor your diabetes. So, the normal results you should get are between 70 to 100 mg/dl. But if you’re a diabetic, your acceptable figures could be till 130 mg/dl. It’s very important to get always steady results from this test. This can show that you’re having a good control on diabetes. In case the figures you get can be higher than 200 mg/dl , than you must remind when did you eat the last time before performing the test. If it’s less than 2 hours, than you must wait for a while and repeat the test after 2 hours you’ve had a meal. But if it’s 2 hours and above, that shows that you haven’t had you medications, or the ones you got didn’t lower your blood glucose levels. So, you may need additional medications to reduce high glucose level. Apart medications, natural alternatives can help lower these high levels. Click here to find it out how. Most important think I want to remind you is : BETTER PREVENT THAN MEDICATE. Thus, it’s better for you to prevent the high glucose levels onset, than to lower it. If you follow better diet strategy, and make some lifestyle changes, for sure you’ll not get these high figures anymore. 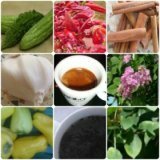 If you want to get to know about one way of beating diabetes naturally and not to get anymore high random blood sugar test results, click here. are older than 50 years old. being part of high risk population. In the above cases you can do this test. If you get results higher than 120 mg/dl but lower than 150 mg/dl, you may consider yourself a pre-diabetic. That means that you don’t have diabetes yet, but you’ve high risk of having it in the future.But if you watch your diet strategy and what lifestyle changes you may do, you may consider yourself safe of diabetes. If you get results higher than 180 mg/dl, than you should repeat the test again and perform other tests to fully diagnose you’re a diabetic. 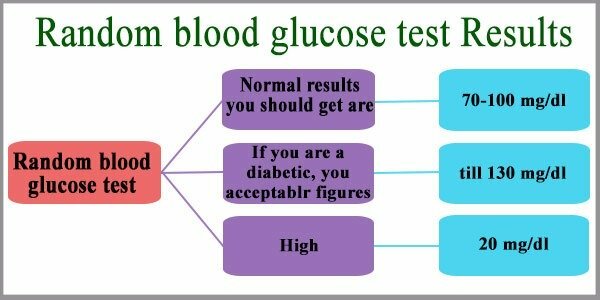 Click here to get to know the additional tests you may need to do, if you get high results of random blood glucose test. Random blood glucose testing is a simple test you get to know about your blood sugar levels. You can measure blood glucose anytime during the day. Should record the results for reference. This will help understand how your blood sugar levels fluctuate during the day. As best told: better prevent than medicate. So, depending on the results we will choose the best treatment strategy for you. If you want to get a more professional help, ask our specialists by clicking here. What can affect random blood glucose test? How random sugar test is performed? What's normal random sugar range?